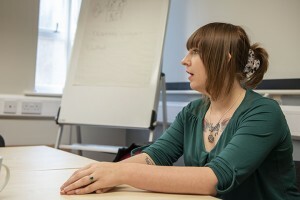 Barnsley Futures is a consortium between Foundation, West Yorkshire CRC and Touchstone. Holden House is a 42 bed multiple needs hostel in the centre of Barnsley. This week in #mentalhealthawarenessweek. The theme for 2018 is around stress awareness, especially in the workplace. At Holden House in Barnsley, customers are taking part in a consultation, helping Foundation to understand better how we can support with mental health issues. Foundation is committed to working alongside our customers, co-productively, to improve service delivery. Andrew Holmes, Foundation’s Customer Board Representative, is leading the consultation alongside other Foundation colleagues. Two customers, Steve and Flo, take part. Steve, a well-built man, enters the room, clutching a gold framed photograph of a beautiful little girl around nine years of age. She is Steve’s daughter, and he is immediately emotional as he explains how he is working towards meeting her for the first time in several years. In the picture, his daughter is holding up a diagram of a family tree. 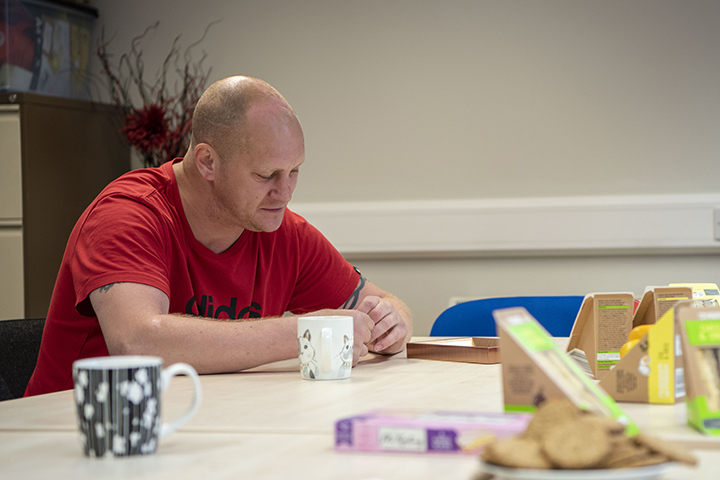 With support from his worker at Holden House, Jill, and his daughter’s Social Worker, Steve has been able to share with his daughter details of her family that she has never met, as she lives in care. Steve wipes his eyes as he shares his commitment to reducing his alcohol consumption so that he can have access to his little girl. He is alcohol dependent and is on a reduction program, starting the final leg the following week when he will begin a course of medication that will help him to safely wean off drinking. When we start the discussion on mental health, both Steve and Flo are fairly nonplussed, neither of them has a diagnosed mental health issue and they don’t see that mental health is an issue that they have to work around. We discuss mental health as existing on a spectrum, and that stress is a mental health issue for example. Flo, a shy and guarded woman, connects with this idea and shares some of the stress she has experienced, living here, at Holden House. Barnsley is currently operating an exclusion zone from the city centre, as a way to combat crime. The exclusion zone boundary sits directly outside the hostel. Over the last few months, a growing number of street drinkers, drug dealers and gang members have been congregating outside the hostel, creating an intimidating atmosphere for both staff and residents. Staff have had to deal with near daily occurrences of overdose from spice on their doorstep, sometimes several times a day. Nikesha, the Service manager, shares how the hostel staff are having to deal with the chaos that exists outside the building, taking their resource from the 42 bed hostel that she manages. Steve tells us that there are rival gangs and shares how in the past few weeks there have been several brawls outside the building as well as constant shouting and open drug dealing. 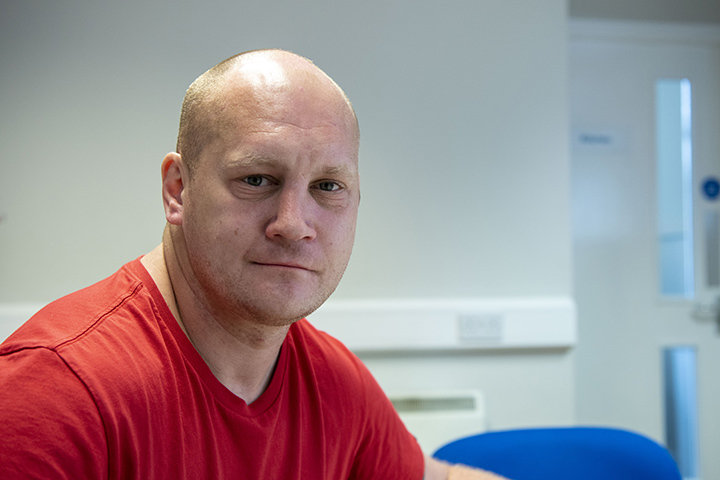 Although he can handle himself and doesn’t feel intimidated, Steve feels he can’t leave the hostel easily, as he’s concerned about becoming embroiled in the trouble outside, putting his own recovery in jeopardy. ‘I’m trying to move on with my life and these days, this is not a nice place to be.’ Indeed, whilst he says that, out of the window, we can see and hear a violent brawl taking place. Flo fled from domestic abuse and Barnsley is outside of the area she comes from. She’s in Holden House as her homelessness is assessed and a property can be found for her to pick up life again. Flo is Sikh and Barnsley doesn’t have a temple she can visit. She has been visiting the local church who have been welcoming, and has made a friend, clearly very important for someone living in isolation. The church have asked Flo if she’d like to volunteer on a weekly basis at a dinner club for the elderly. She would like to, but she hasn’t done so as yet. Flo is also fearful of leaving the hostel, and especially of returning later in the evening. She also feels embarrassed as her new friend won’t walk home with her from church, despite living close by, due to the crowds outside. Flo feels she has to explain that these people aren’t residents and that inside Holden House, life is very different. Steve agrees with Flo, inside the hostel he feels safe. He keeps himself to himself, and has, ‘amazing support’ from Jill and others. He has taken part in a music course which he thoroughly enjoyed. He has also been involved in interviewing for staff at the hostel, and proudly announces how Gavin, Team Leader here, was one of his picks. Flo agrees that the hostel has a lot of good stuff going on, she has been enjoying Bingo and stained glass workshops. There are plans for a porta-cabin out the back of the hostel that will become a permanent customer space and workshop for activities. All present share how staff and customers in the hostel are sticking together through these difficult times, looking out for one another. Nikesha and Scarlett, the staff present, have an open and mutually respectful rapport with their customers. By the end of the hour together, Steve and Flo are sharing their experiences and feelings openly with Andrew. Andrew has, by his own admission, has issues from his past that can impact on his mental health today. He values how well he currently is, and works to nurture his well-being. Listening to customers and colleagues during the consultation, he is clearly moved and as the workshop comes to a close, he makes a passionate and sincere promise that he will share what he has heard here today with the board. Both Steve and Flo thank him for listening, they obviously feel heard. He is visibly upset about the pressure that staff and especially customers, are facing on a day to day basis here at Holden House, ‘this is your home, you should feel like this is a place where you can begin to move on with your lives.’ His concern for the staff is huge, he worries about the cumulative effect of witnessing and dealing with the chaotic behavior outside the hostel every day. ‘What can we do?’ he implores Nikeisha, who explains that behind the scenes wheels are turning, but in Barnsley the resource in city centre policing is very low, so it is hard to say immediately how things will improve. Suggestions have been made to extend the exclusion zone, but as Nikeisha explains, this just moves the problem on to somewhere else, to outside someone else’s front door. Nikeisha feels a weight of responsibility to keep her staff and customers safe. And it is clear that inside the hostel, she is doing a fantastic job. Steve’s journey to the present hasn’t been smooth, but he isn’t judged and is treated with empathy and understanding. Flo, although shy, is able to approach all the staff here she says, and most importantly, she feels very safe inside the hostel. 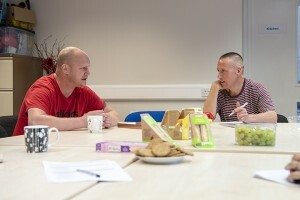 The hostel delivers a multiple needs service, and this includes supporting people with explicit mental health needs. What is clear from the consultation today, is that in this environment, everyone’s mental health is impacted. Whether that be through stress and responsibility or fear and intimidation. When we ask, ‘What can Foundation do to better support our customers with mental health issues’, both customers immediately refer to the issues going on outside and want the staff to be included in terms of any debate around mental health. The consortium are working hard with the local authority and policeforce to tackle the issues that the hostel is facing outside its walls. Inside, there are the obvious pressures that are felt across our sector, of low resource and high workloads, but there is also a determination to deliver support and stability to customers, to inspire independence and to transform lives.